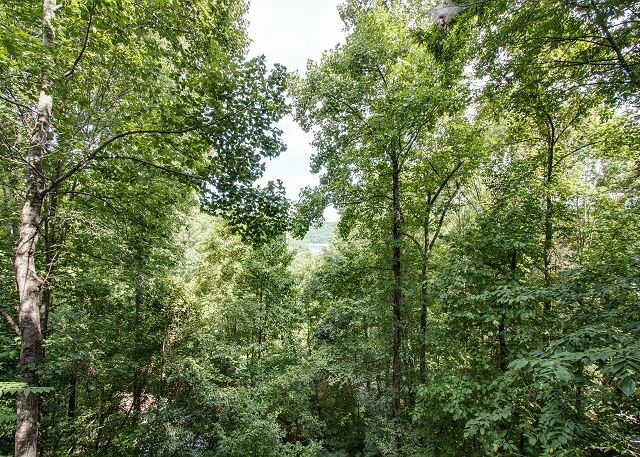 Smithville, TN United States - Cherokee Hideaway | Center Hill Chalets Inc. Vacation rental house. 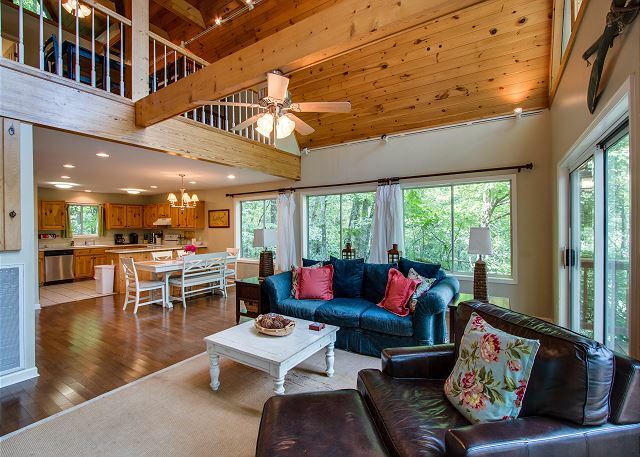 Sleeps 12, 3 bedrooms, 3.75 bathrooms. Dogs allowed. 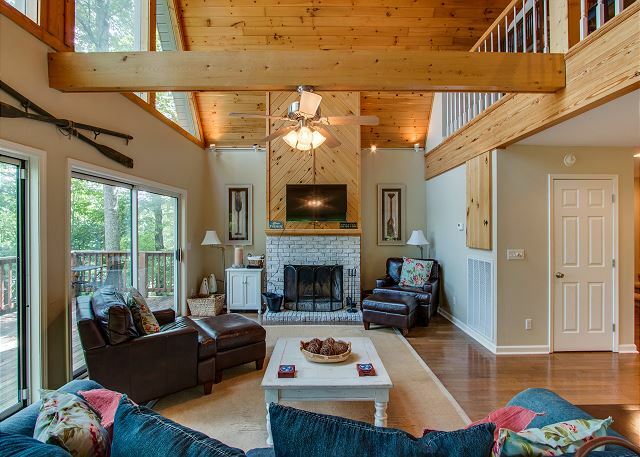 This beautiful lake house has been a family favorite for many years. 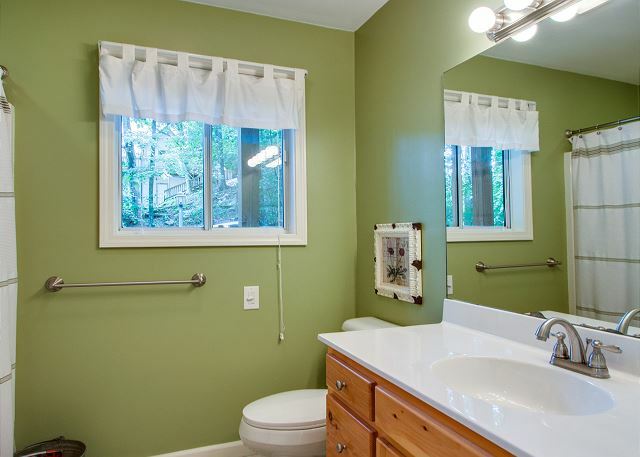 Cherokee has been renovated and updated for a perfect modern lake house feel. This home will sleep 12 comfortably. It has 3 bedrooms, plus loft and fold-out sofa in basement, game room, 3 full baths, 2 half baths, large open floor plan, vaulted ceiling. 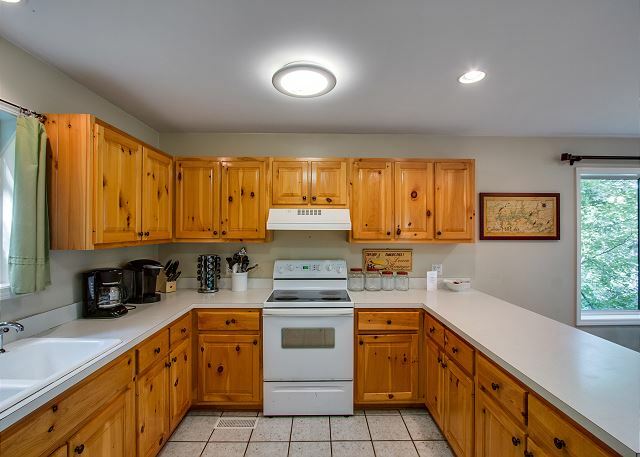 Cherokee has a very nice large bright kitchen, lots of counter space, and all of the amenities you need to cook. There is a Keurig, so bring your favorite flavors. 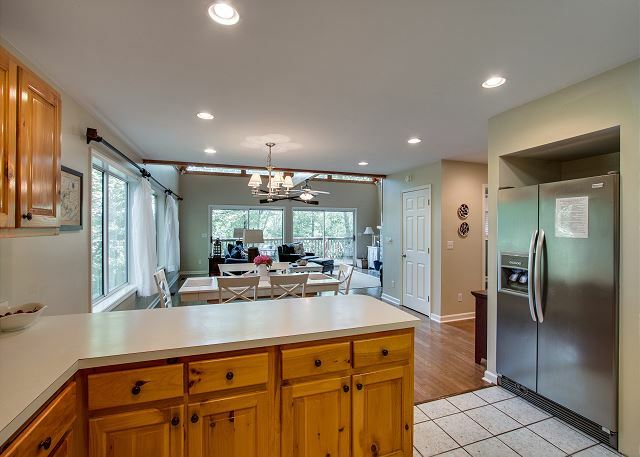 The home also features a nice bright dining room/living room combo with flat screen TV on the second level, cable television, DVD, cozy wood burning fireplace to enjoy in the winter months, decks to enjoy the beautiful sunrises or sit back and relax under the starlit sky. 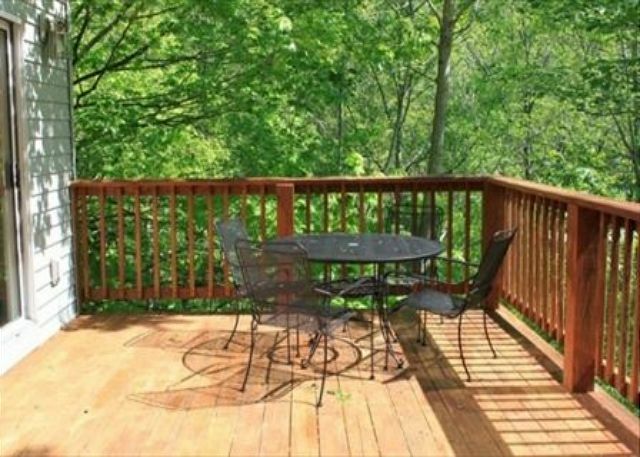 Other amenities include gas grill, nice cozy covered hot tub, finished basement with ping pong table and board games. 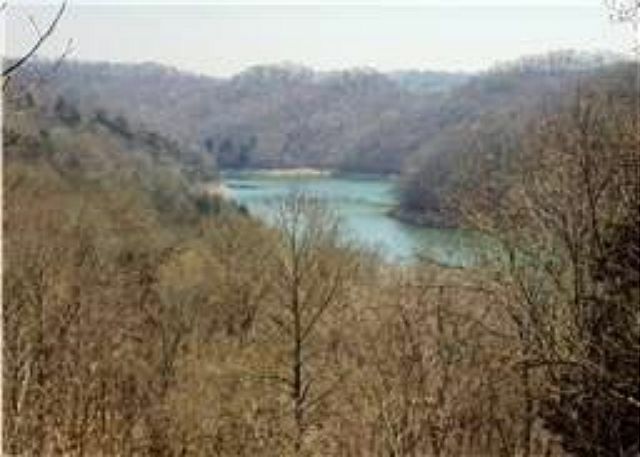 There is a nice view of Eagle Creek and a cute fire ring out back for small camp fires to make your family s'mores. There is no boat parking at this property. Minutes to Hurricane Marina (call marina for boat slip rentals), Appalachian Center for Crafts, Canoe the Caney Adventures and I-40. Pets must be approved by our Chalet Management, and must not exceed 20 pounds. We charge a non-refundable pet fee that will not reflect in your online booking total. Please call the office for details. Great for your family getaway! Beautiful place tucked away a little distance from the lake. Very spacious, bed in the master Room was beyond comfortable. Limitless amount of space. Highly recommended for any bigger group. Only thing I was not pleased with was the cleanliness. Whoever they have should spend more time on the house. Thank you for your review, Jacklyn! We are glad you enjoyed Cherokee Hideaway, and we sincerely apologize for the cleanliness issue of the home. Our cleaning staff works very hard to make sure each and everyone of our homes are spotless for our renters. In the case of a housekeeper not leaving your rental in perfect condition, if you were to call our appropriate contact numbers, we could accommodate you for a touch up on the home if it does not fit cleanliness standards during your stay. We are looking forward to your next stay with us! Center hill chalets are amazing and worked with us so well!!! To start off with I would like to say that the first cabin we rented wasn't what we were expecting at all. One call to the office (Jennifer) and we were on our way to the most amazing lake house (Cherokee Hideaway) I had ever been to. Jennifer was VERY helpful and understanding.. She was super sweet and very willing to help. We met Chris the maintenance guy also. He was very nice & Helpful and told us of all kinds of things to do. Everything inside was super clean and neat. I have got to say the queen bed in the master bedroom was the most comfortable bed I have ever slept in!!! (Jennifer if you read this, can you tell me what kind of bed it is or foam mattress on top?? lol!) The shower in the master room was AMAZING also. I'll be buying a new shower head at home. 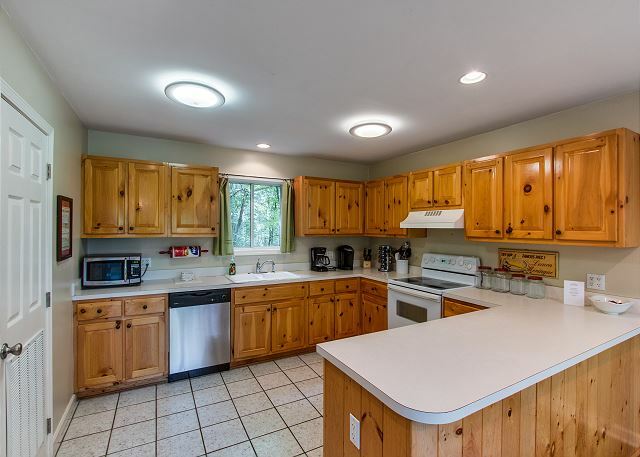 The kitchen has EVERYTHING you would ever need to cook anything, literally. The view is priceless. The neighbor Carol, is a very sweet lady! She came over and talked to us for a while. She loves having "neighbors" at the cherokee hideaway. She loved my husbands guitar playing too :) She said one time people had brought bagpipes and she enjoyed that very much. Told us to be careful or we will be selling our house in 30 days and moving here (like she did).. Sounded very tempting haha. I would like to come back and bring my kiddo's and family here. Location was great. About 10 minutes from Smithville. I will say the stairs had my legs burning. Only because I would go downstairs and forget everything upstairs.. over & over again lol! I have nothing bad to say about this lake house. I can't think of one thing that was missing or one thing I need that wasn't there. I can't think of anything else they could have added to the lake house. It was perfect and i'm not just saying that. 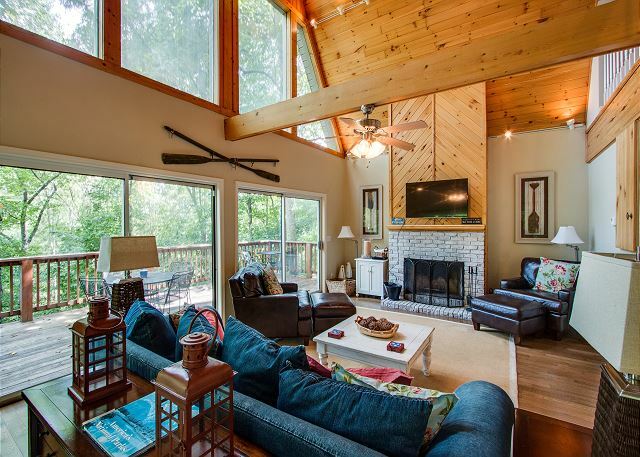 This lake house is totally worth it! Don't second guess it, go ahead and book it!! You won't be sorry!! We are glad you enjoyed your stay and were able to help! The mattress you are talking bout is a memory foam pillow top. We look forward to your return and if you are ever looking to buy in the area call our office. We are happy to help. Thank you for your review! 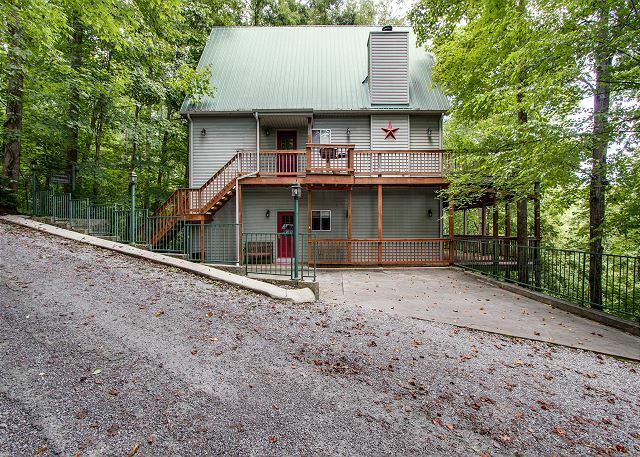 We rented Cherokee Hideaway for a military reunion - 5 couples + 1. Lovely home, beautiful location and great views which means lots of stairs. Enjoyed the fire pit and hot tub. The rental staff was very nice and knowledgeable about their cabins. We are glad you enjoyed your stay and look forward to your future visits! Thank you for your service and all you do! This was a great weekend getaway, the condo was very nice, however, the view of the lake was obstructed. Nonetheless, we had a great time and were just 10-15 from the boat dock. We would definitely come back. We are glad you enjoyed your stay. When everything is in full bloom for the summer the lake view is somewhat more blocked than in the fall and winter months. We look forward to your next visit. My husband and I wanted a nice long weekend away to relax and that's just what we got. It was off season so no one was around and it was so peaceful and quiet. The house was perfect, it was large for the 2 of us but that was just fine with us. There were a bunch of games to play, a pool table and hot tub which gave us some things to do. We would definitely book this home especially with other people to enjoy. Thank you for your review! We are glad you enjoyed your getaway for two and look forward to seeing you again! Love the area - can go hike, walk the road, or go down to the lake. 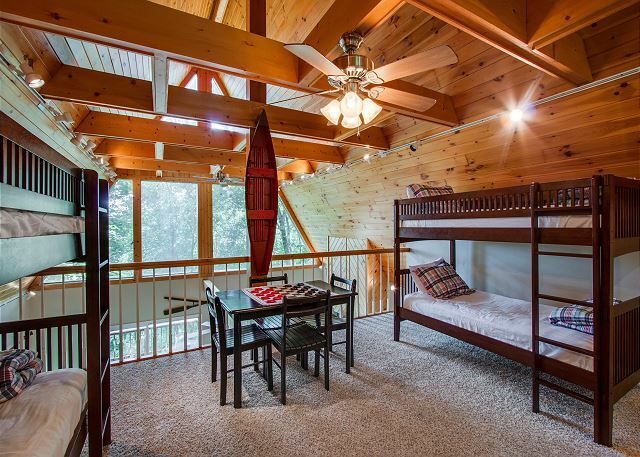 Big enough cabin to separate yet get together when you want. It's a family tradition that we come every year. We are glad you enjoyed your stay. There are many places close by for hiking and lake access around the area. If you call our office we will give you more recommendations for your next stay as well. We can't wait to see you again! Wonderful experience. 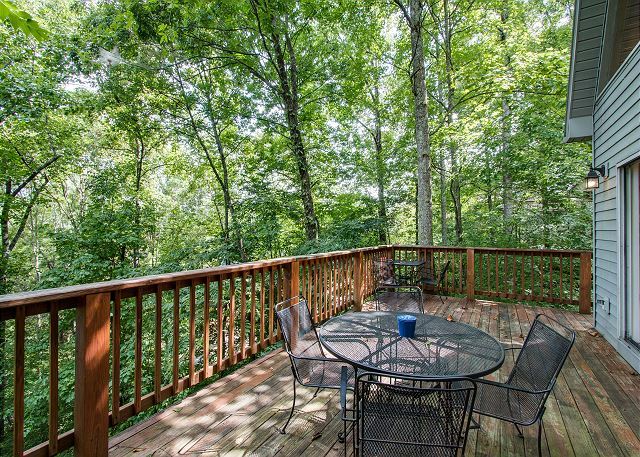 The cabin is a quick walk to the lake, but nestled in the woods. 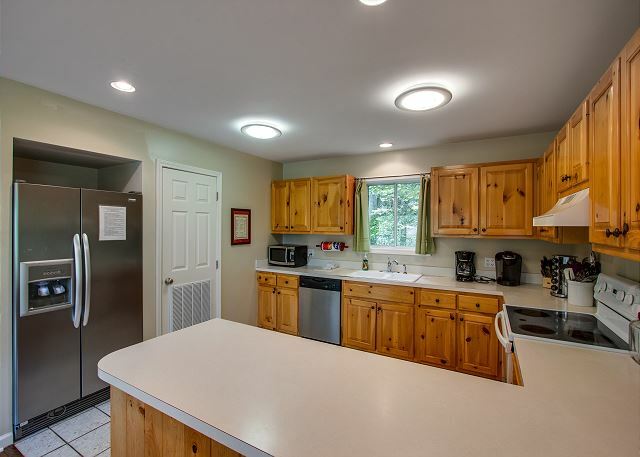 The cabin itself is well stocked, clean, and has everything you could need. There's a great fire pit in the backyard that made for a perfect night. I would highly recommend. We rented the house for my son and family of four's visit. We all enjoyed having plenty of room to spread out. Our last full day was spent at the kitchen table in a Monopoly marathon. This was the second time we have rented this house for family get togethers and will definitely do it again. This was a great property. It was clean and stocked with more than the minimum listed. The grill was missing the ignitor but we found a grill lighter in the kitchen drawer. The grill needed cleaning. We had a silicone cooking sheet with us which we used. Directions to the property could be improved. The mileage was accurate but we never saw gravel roads on the right. Instructions to report immediately anything we found wrong were a little confusing because they stated you would be charged a fee if the call was not an emergency (if not normal office hours). We were a little disappointed that there was no lake access from the community. It requires returning to the main road and driving. However,the property had many games available so we just enjoyed staying there and being together. Several roads in the area would best be navigated with a four wheel drive. This property was not a problem to reach but parking space allows only enough for three cars. We are glad you enjoyed your stay! There is a small beach and a boat launch at the end of the road. We apologize you were not able to locate that area. We also allow parking at our office for additional cars for our lake homes. 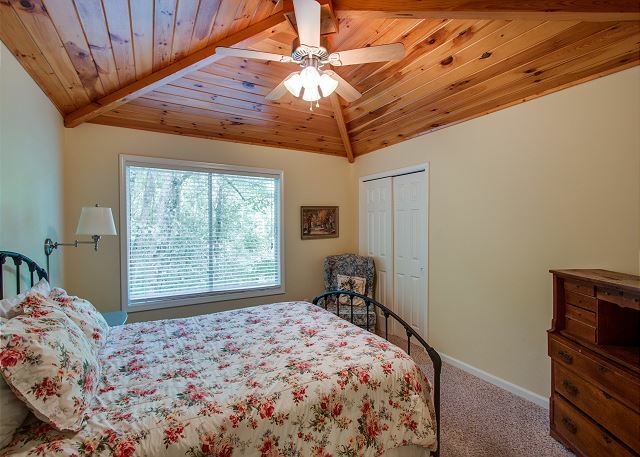 This is available so our guests can meet and commute to the properties if the cabin has limited parking. We look forward to seeing you again! We looked far and wide to find this house and it was as great as advertised. 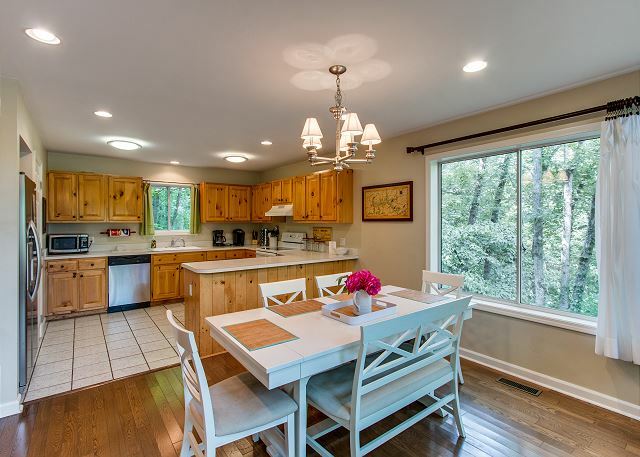 The kitchen is well supplied, the location is perfect, the woods gorgeous, the furniture comfortable and nice! Only disappointing features were the pool table and grill. The pool table, which was one special feature we wanted, has two serious ridges in the table where the slate has shifted. And the grill needs some maintenance and parts. We will stay again next year if we can be sure the pool table has been repaired. We are glad you enjoyed your stay. We are looking into the issues with the pool table and putting in a service order for the grill. We look forward to seeing you again! Marisa, thanks for staying with us and we hope that you come and stay again. In short, we had a great time and the property management was excellent. Nathan, thanks for staying with us and please come stay again with us. Have a great week and New Year! I found this cabin by luck! My husband turned 50 in August and his brother and his family, who live in St. Louis, wanted a celebration with him too. So I was challenged with finding something available on labor day weekend. I found this cabin and it was perfect. They have four children I have two children so it was quite a group but the house is so large we had plenty of room the location was beautiful because you could see the lake from the deck we rented a pontoon boat from a local marina for one day and had a wonderful time . 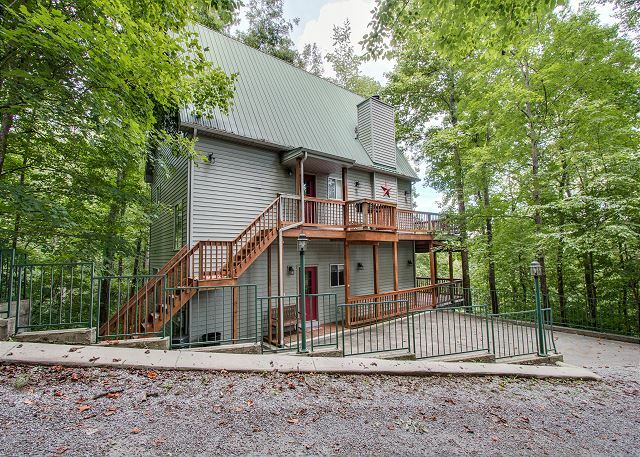 We did not want a lot of commercialization to distract from our visit and this location was perfect the lake view was beautiful all of the decks the kitchen was large the game room was awesome we had a fabulous stay. Very nice and clean too and management were very nice and extremely helpful with anything we had a question about. Suzanne, thanks for staying with us and please do come back and stay again. The house exceeded our expectations in every way! John, thanks for your review. We're glad you enjoyed your stay. Please come back and see us again, soon. Third time at this cabin, and we still love it!!! WOW... It is is always great to have a returning satisfied customer. We hope you return again, soon. 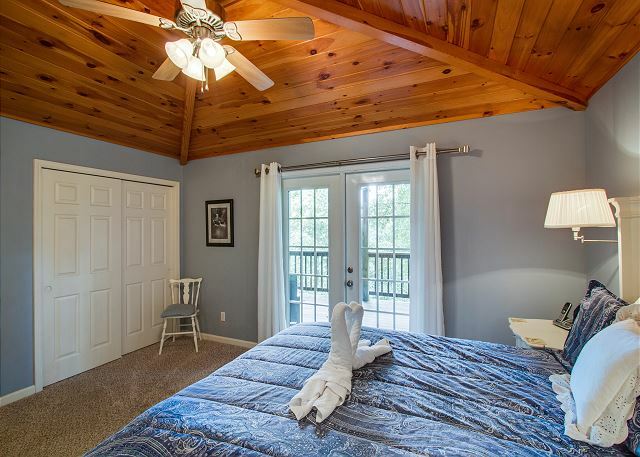 The cabin is an absolutely wonderful getaway with great amenities. The pictures online don't fully do this place justice. I will be returning, probably several times. Thanks for your great review. We appreciate you coming and staying with us. Please come back and stay again. I was vey please t bring a group of friends to this house. 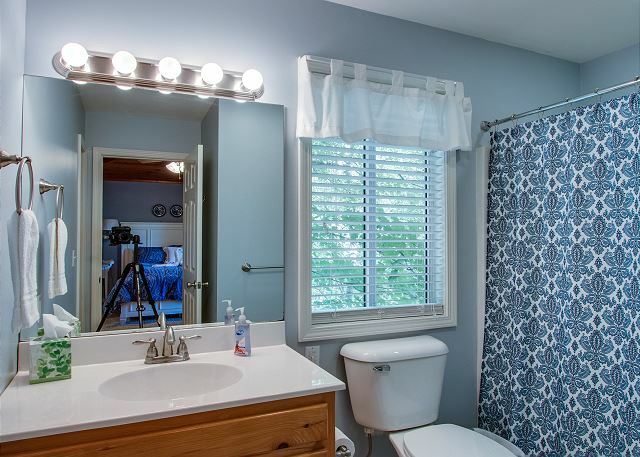 It was a beautiful location and the house was very spacious and clean. I think it's important to note that there are a lot if stairs and we felt like we were always climbing some. That wasn't a big issue for us, but it could be with other families who have toddlers or older people. It was nice for the teenagers in our group to have their own space. 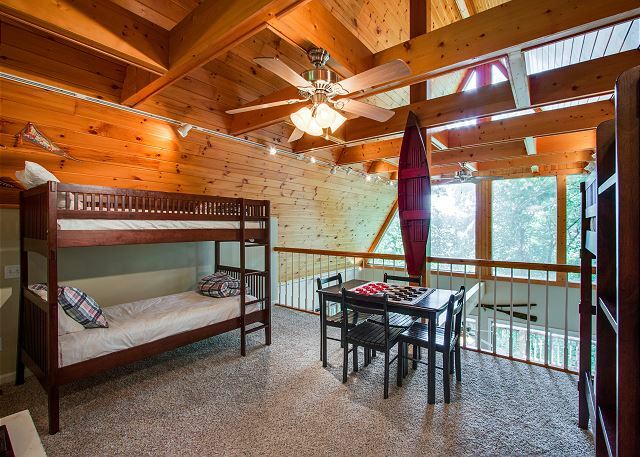 They slept in the 4 th floor loft and hung out in the basement game room. The decks were a nice place to relax. Thank you, Pamela. 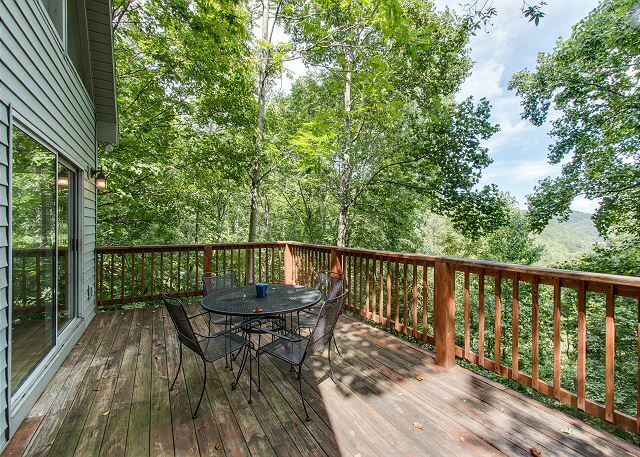 Cherokee Hideaway is one of our most popular rentals. We are happy you enjoyed your stay. This was a half way point for our family with people coming from Iowa, North Carolina, and Clarksville, TN. There were 11 of us and we all had plenty of room including the kids with their own loft and TV. 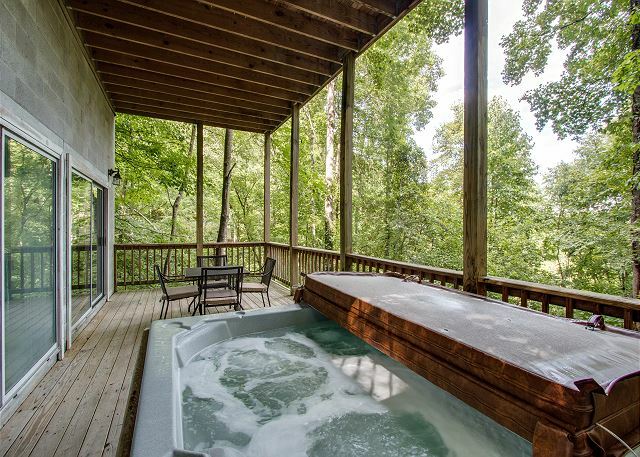 The game room was a bonus as well as the hot tub and the deck. We all had a great time and planning for next year. We would definitely recommend this home for any large group. Thank you, Richard. We are very pleased you enjoyed your stay with us and look forward to your return. Deana: Thanks for your review. We're glad your stay was great. Come back and see us again, soon. Great house with beautiful view. Most of house was clean (visible areas) but lots of dust/webs in hidden areas (behind washer/dryer, top corners, behind furniture). Puddle in basement corner near hot tub with mold/mildew. Bad smell. Very suitable for families. Kids loved the basement with pool table, ping pong table, game table and TV! They also loved having their own spacious room. Loft area was nice hideaway. Narrow road up mountain was a little nail biting! We had a couples weekend and rented this cabin. There was ample space for all to sleep. Most everything was great with the exception of the game room, which was not heated! We would have loved to take advantage of the pool and ping-pong tables, darts etc. but it was unbearably cold on that level of the house! Otherwise we had a fabulous stay and would stay there the summer!!! Great stay at the Cherokee hideaway. We had a great time the cabin is nicely decorated and plenty big enough for 12 to sleep comfortable. We have rented cabins for several years from Center Hill Chalets. We have been happy with all of them, but this particular property was perfect for the crowd we had this weekend. Lots of privacy between floors to help with younger ones and bedtimes as well as plenty of kitchen space for a big crowd. We enjoyed our short stay with 12 adults that you graciously booked last minute for us. Great facility, great price and we would stay there again. Great Stay at the Hideway! Our experience at Cherokee Hideway was very nice. Clean, spacious, well equipped home. Only suggestion is to have written instructions for hooking up DVD to TV (that is if you don't have your kids with you to figure it out!) If we get the opportunity we would stay at Cherokee Hideaway again! * the toilet on the top floor was stopped up. * the basement has water damage that allowed water from rain to collect around the base of the Ping-pong table. * the flue on the fireplace was opened when we arrived. This allowed the storm winds to blow ashes into the living room. 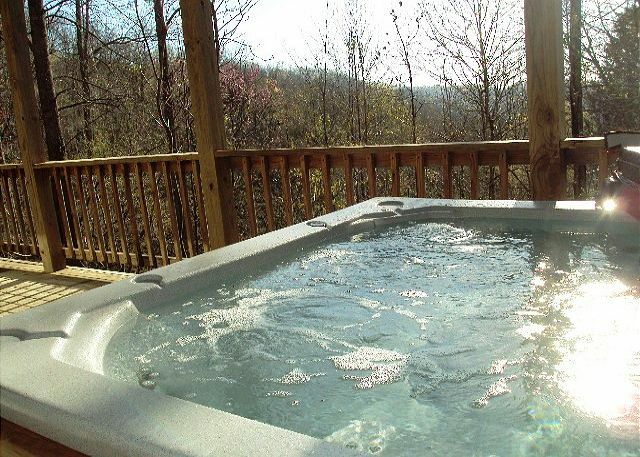 * the hot tub water was green and looked as though it had not been treated for some time. We are 3 generations that have been enjoying Thanksgiving at Center Hill Chalets for about 7 years and Cherokee Hideaway for 2nd year. It meets our need for our blended family to be in a beautiful setting without the commercial aspects of vacations and therefore much wonderful interaction such a board games, hikes, etc. We highly recommend this property. I had an overall great time at the property rental. Was disappointed in location of fire pit. 22 stairs down, then downhill from there. Lots of stairs in house too, but lots of privacy. Great kitchen and fireplace. I would rent again. My friends and I enjoyed a fantastic 2 days at the Cherokee Hideaway chalet. It was more than spacious enough for our party and had ample sleeping accommodations and showers. It was a short drive to the local marina and local stores made stocking up for the weekend easy. Id recommend the chalet to anyone looking for a relaxing stay in a well equipped, beautiful location. Plan on carpooling as the drive and front shoulder of the road can quickly become full. I love this property! I hate to say anything even remotely negative but I am afraid the fridge is about to go out. The freezer was perfect but the fridge side was barely cool. it worked out but I thought the owner would want to know. DIshwasher worked fine but it is making serious noise. may want to take a look at this. WE loved it thank you so much! The amount of towels was perfect. 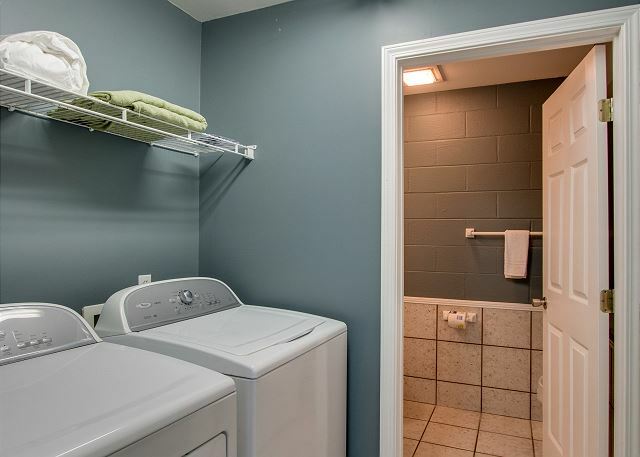 Washer dryer were awesome. 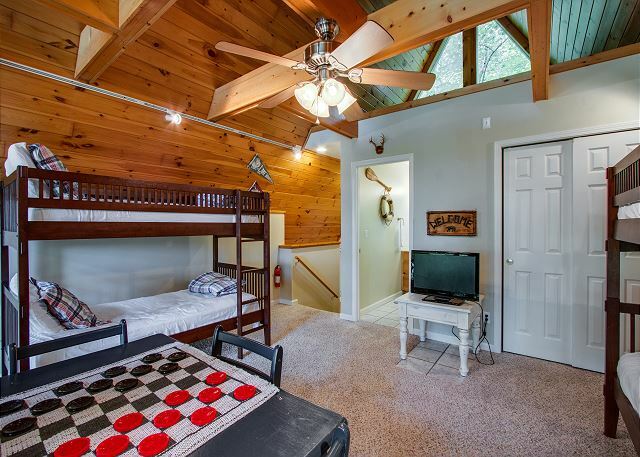 Thank you so much for your review, Cherokee Hideaway was recently sold, and the new owners have invested in new appliances new bathroom fixtures, new lights, new drop ceiling in the basement, and we have a new 50' TV being installed in the game room in the next few weeks. come back and see us soon. The cabin was clean and the staff was friendly. There was a lot of room in the cabin, but a lot of steps (4 floors!). 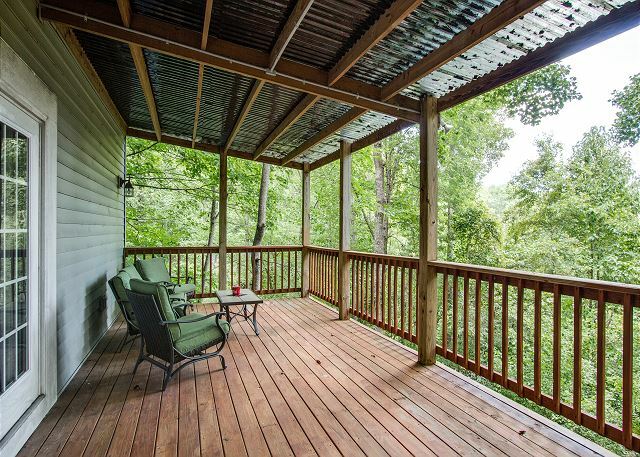 The cabin is in a good location away from civilization and the lake can be seen from the deck. Parking is limited. 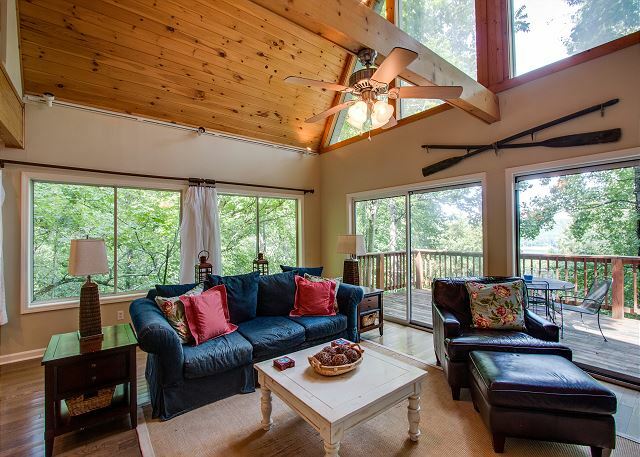 I would rent this cabin again as a secluded get away close to the lake! This house is nice. Its big and has a lot of room. The bedrooms were fine. The view was good. Had everything we needed. Bunk area for the kids was great. Few things to consider...make sure to have a gps to get you there. It is back in the woods a ways and the signage it not that great to get you there. Only parking for two vehicles not boat parking. My husband and our friends had an amazing time staying at this charming property. Loved how there was truly room for everyone to sleep comfortably--and we really enjoyed the ping pong table and the hot tub. Wasn't too bad of a drive from the lake either! The place was exceptionally clean and nicely decorated. Went above our expectations...thanks!!! The kitchen is huge and nice for a large group. The kids were in loft in the bunk beds and we blew up an air mattress, but the noise from the adults really disturbed their sleep, both in p.m. and a.m. The decks and outside really needed to be cleaned up...leaves, spider webs, and bird droppings and there was only chairs to sit in on top deck. None at hot tub. We had a blast, though. The house was plenty big and located close enough to both Hurricane and Holmes Creek Marinas for boating, and the rental company good to work with. Our vacation rental was great. Do have to say this home is one of a kind and in a remote location. If you’re looking to get away from it all; this is the place from you. We loved it. Great view, very quiet. Sherry and her staff were super nice to work with. Couldn’t have asked for a better set-up within one weeks’ notice. Thanks for everything. We stayed for 3 days with our family that included 12 people. The weather was fantastic, the view of the lake beautiful, and the area great for hiking and walking. We had some issues with the heat and hot water for the lower half of the rental, but as soon as I called the office, she had someone out to take care of things quickly. We love this area and will definitely be back again:) Thank you for making our Thanksgiving holiday so memorable! 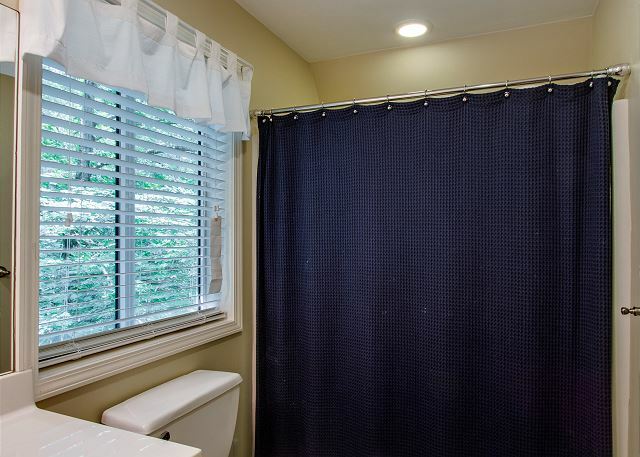 We have used your company for the last several years and always been pleased with the houses. This one we have used twice now, and loved it. We loved this house! The decor was so cute and it was plenty of room for all of us girls. The view was fantastic as well!! We would definitely come back again. We really enjoyed the stay. The Hideaway was spacious and just the right size for 12 ppl. There were a few things that weren't just totaly up to par but nothing we couldn't put up with. Will very likely go again sometime. We had a great time. Plenty of room for everyone and a beautiful location. nice large house in the woods with great views. perfect for family with teenagers. 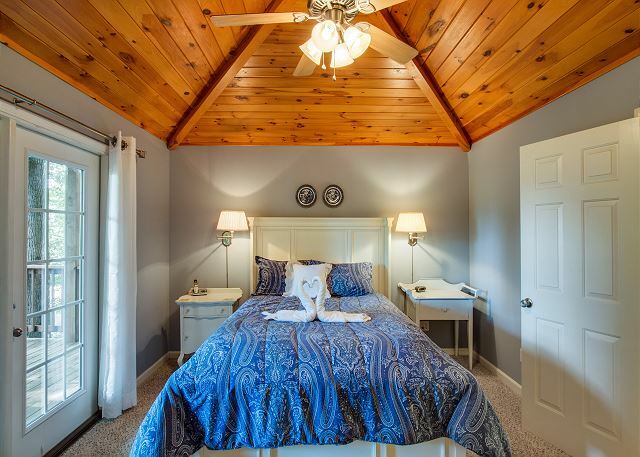 Beautiful views, comfortable beds and convenient location in middle Tennessee. We' ll definitely be back!